When building a landing page for a mobile app, it is necessary to select the design which is able to present the application’s features prominently and is highly conversion optimized. In order to build a high quality app landing page, developers often choose templates built with Bootstrap, as it is easier to work with and helps in customizing the template as needed. 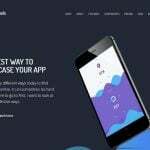 In this article, we have selected some of the best free and premium mobile app landing page templates that are based on Bootstrap. We have made sure to select the latest and best app landing page HTML templates built with Bootstrap. You will find templates built with both Bootstrap 4 as well as Bootstrap 3 in our collection. Both the versions of Bootstrap are quite popular for building websites and templates. Bootstrap 3 is the tried and trusted version while Bootstrap 4 offers cutting edge web technologies such as flexbox grid and latest development toolset. Additionally, you can choose to go with Bootstrap 4 UI Kits which offer unique and extensive building blocks for a website. As expected, all these mobile app website templates are responsive and have modern designs. 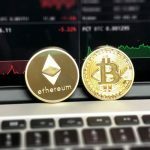 Most of the templates listed below are available for free download, while some of them are either premium or offer both free and paid version. 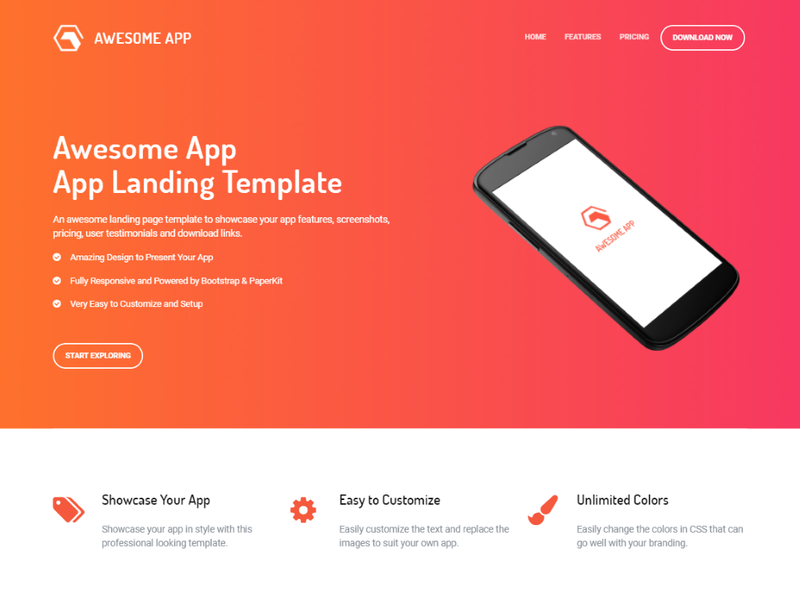 Built by TemplateFlip, Awesome App is a modern, responsive and conversion optimized app landing page template. The template has been built with Paper Kit 2 which is a UI Kit based on Bootstrap 4. 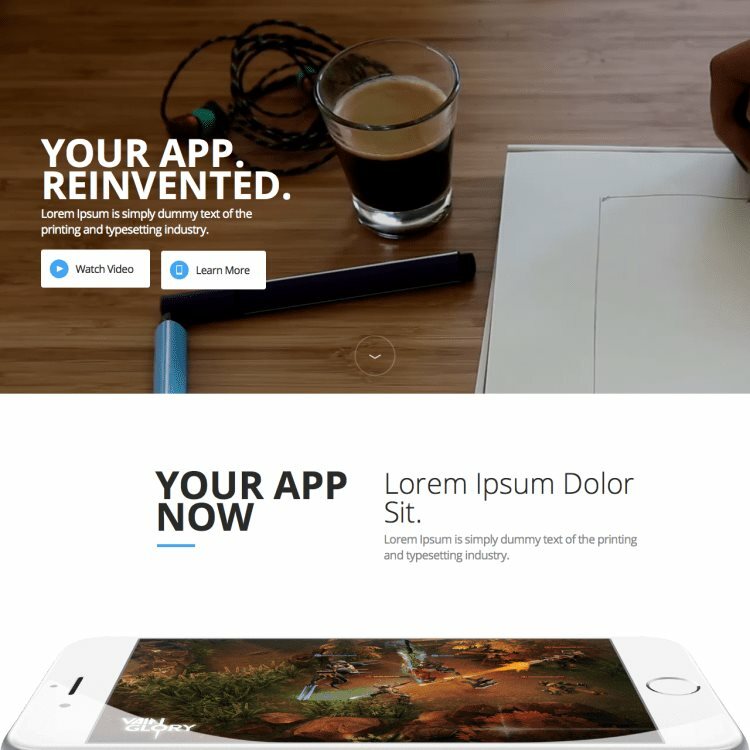 The app landing page template has a glorious design and is well suited to showcase your app and its features. It also has sections for displaying app screenshots, pricing table, user testimonials/reviews as well as a download section which can contain links to app store downloads. 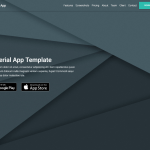 MDB is one of the most popular Material Design frameworks built with Bootstrap. 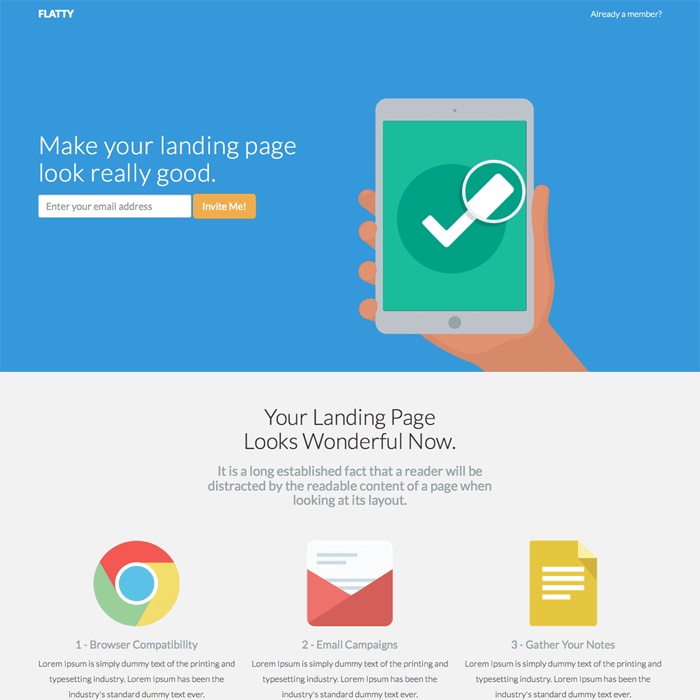 MDB’s landing page template offers a Material Design feel as well as animations in its landing pages. 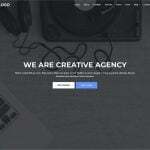 This template pack contains landing pages for many different niche such as Agency, Brand, Event as well for Software and Apps. This template has been professionally built and you also get technical support if needed. This template is your best choice if you are looking to build an app landing page in Google’s material design style. 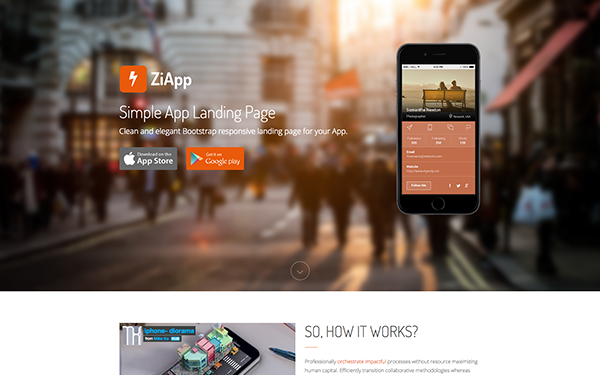 Awesome Landing Page by Creative Tim is another great choice when building a website for showcasing mobile apps. This modern design template is completely free to download and use and has been built with Bootstrap. 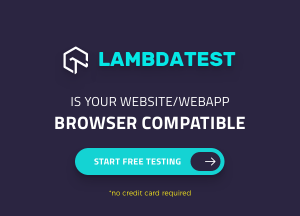 You get different color theme options as well as multiple pre-built landing pages in the download. The template is also suitable for showcasing desktop apps or web apps. 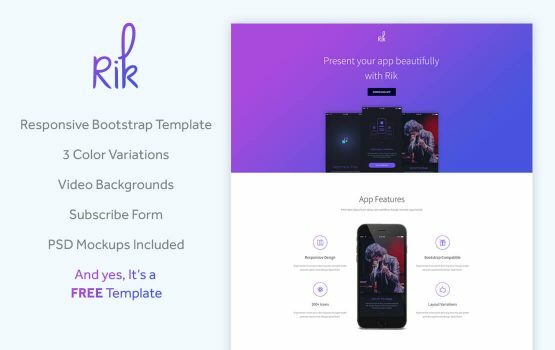 Rik is a beautiful and free template for mobile apps. It is built with HTML5, CSS3 and Bootstrap. It offers 3 pre-defined color variations: Blue, Purple and Orange, which you can easily switch. The template supports image background, gradient background as well as video backgrounds in the header. PSD Mokcups of the iPhone is also included with the template to allow you to generate phone image with your own mobile app screen. This SEO friendly landing page template has detailed online documentation to help you get started quickly. 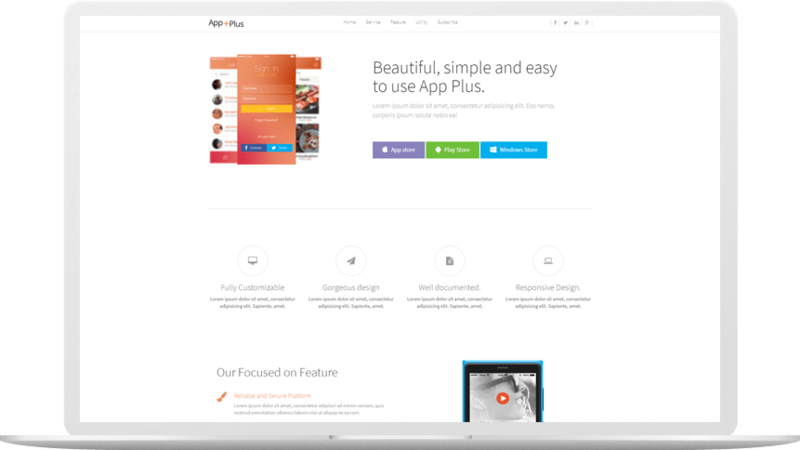 App Plus is a lightweight and creative app landing page template built with Bootstrap. 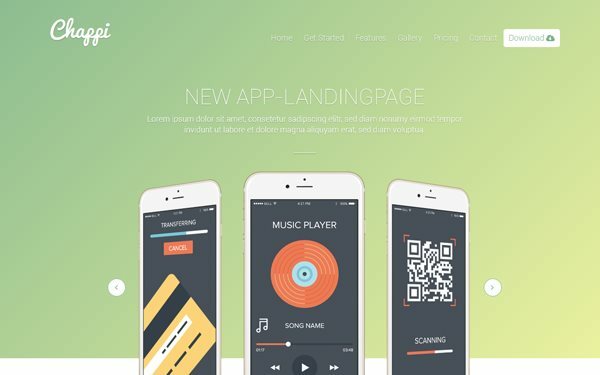 This HTML5 app template is optimized for detailed app presentation and conversion. It includes subtle animations to catch visitor attention. The template also includes a converting email capturing form. 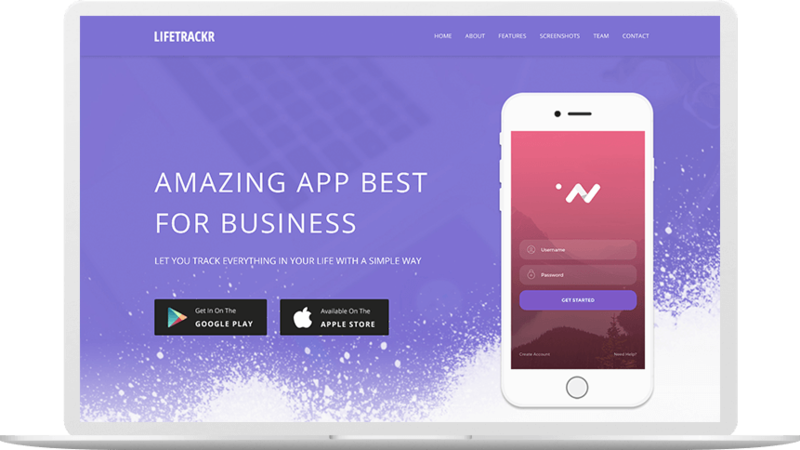 Lifetrakr is a Bootstrap based conversion optimized mobile app marketing website template. The code base is well documentation and W3C validated. 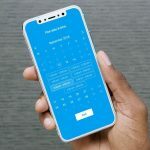 The template includes different sections such as app features, promo video, subscription/pricing plan table, customer testimonials as well as e-mail subscribe form. 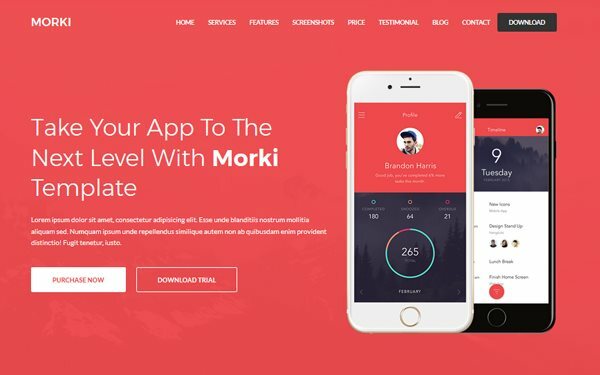 Morki is a premium landing page template suitable for promoting your mobile apps, saas applications, software, digital products or even e-books and magazines. The template offers 12 different color variations and has 20+ pre-designed pages which include shop, product details, team, coming soon, blog, blog details page and a lot more. The template is speed and SEO optimized and contains AJAX powered contact form. 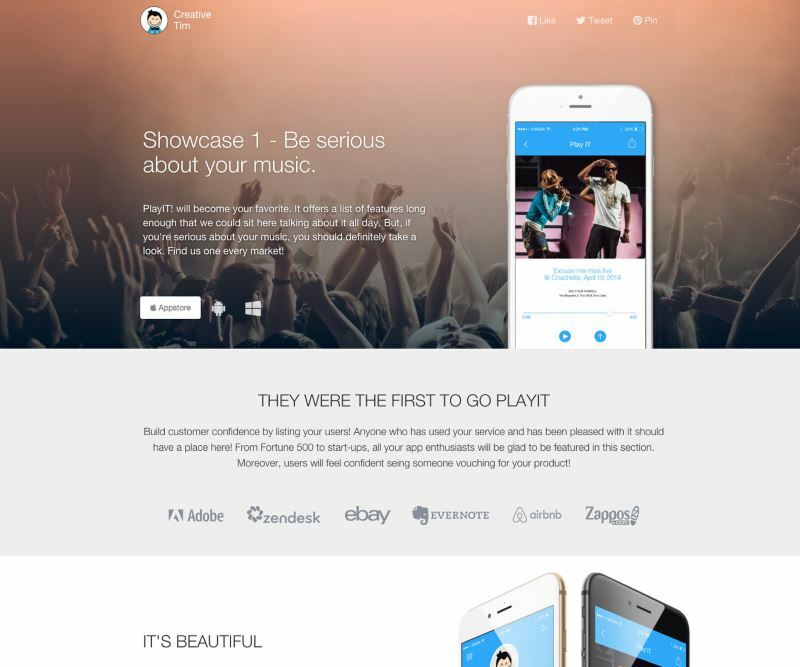 Chappi is a perfect template for presenting any app. It comes with 5 pre-defined color variations and has different layouts which include parallax layout as well as particle animation header layout. The template includes working contact form and MailChimp ready newsletter subscription form. 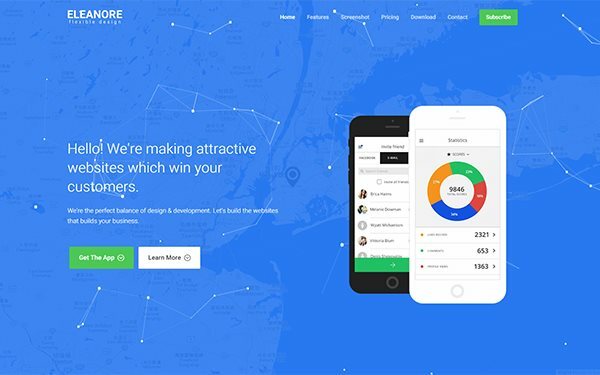 Eleanore is a flexible app landing page with creative and modern design. It offers multiple choices for page header background which includes animated gradient, animated cloud, animated particles, slideshow background and parallax background. The template also includes support for playing a background music. Working PHP contact form and MailChimp forms are also included with the template. 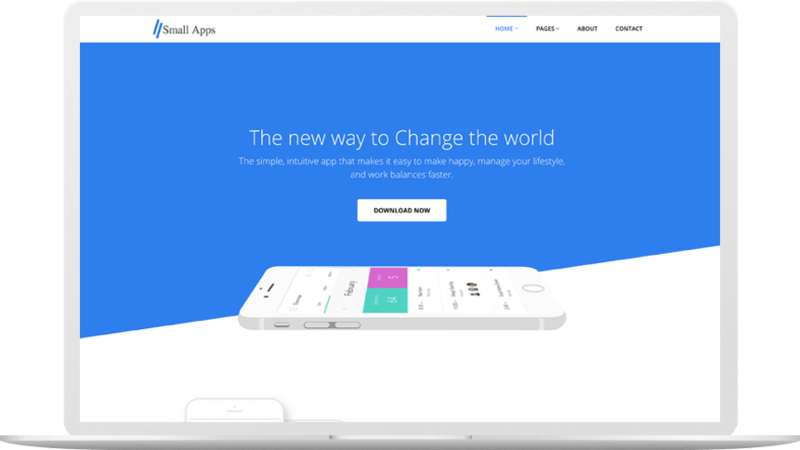 Appi is a sleek landing page template designed to show your next app, site or product. It has a fresh style and minimal design. The template supports full screen video background and is great for including a demo video of your app on game in the background of page header. This free template includes an about page for your team apart from the app landing page as homepage. 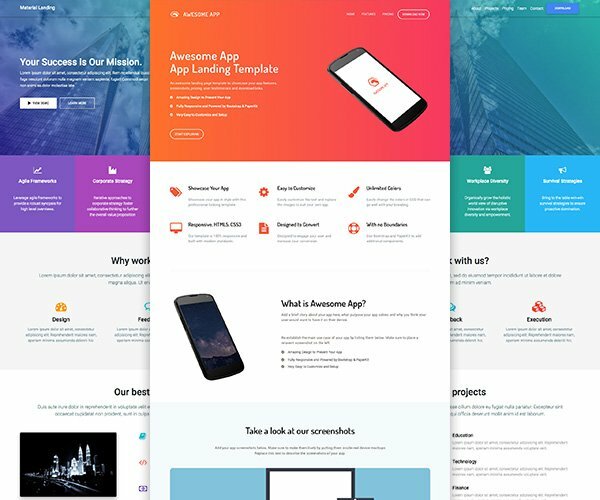 If you are a fan of flat UI design then this app landing page template called Flatty is perfect fit for your app’s website. Utilizing the flat color scheme, this free app landing page template is lightweight and minimal. 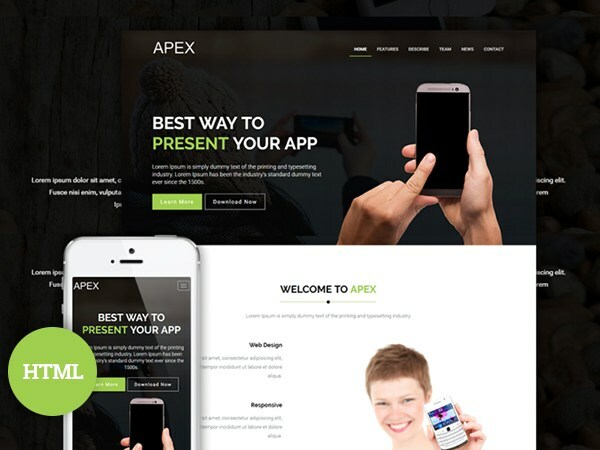 Apex is a one page responsive landing page HTML5 template for app product showcase. It has been built with Bootstrap 3 framework. Apex is a responsive and retina ready template with fully commented code. It is offered as free download as well as a paid variant is available. 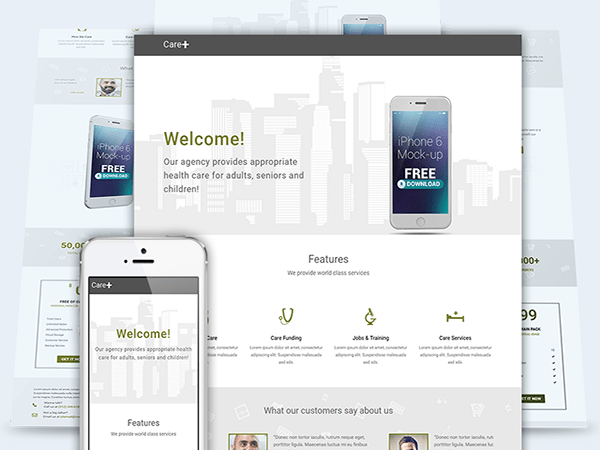 CarePlus app landing page template is another Bootstrap based responsive website template suitable for showcasing your app. The template is cross browser compatible, has valid HTML5 & CSS3 code and is available for both free and paid download. When you have an app published in the app store or play store, it is necessary to create a landing page for it in order to allow your users to discover your app through other means such as Google search. 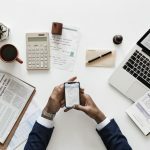 Many popular apps have their landing pages which help them in acquiring more users as well as serve as a single destination for offering downloads in different app stores such as on iOS, Android and Windows. Picking the right template for your app’s website is key when you are building an app landing page. With our picks of Bootstrap app landing page templates, you are sure to get a responsive, well designed website for your app. Don’t forget to take a look at these Bootstrap business templates and one page landing templates for more choices. 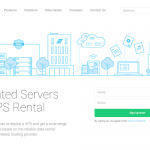 In case you are looking for a WordPress website instead then take a look at these app showcase WordPress themes.